A light tactical war game during the age of sail where two ships face off against one another on the sea. There are basically two layers to the game, the broadsides portion in which players plot their movement with a deck of cards, attempting to maneuver their ships in such a way that they can fire a volley of cannon balls at the opponent while minimizing the risk of return fire. 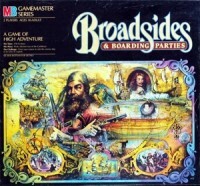 Add a Review for "Broadsides and Boarding Parties"